Summary : A bagged black tea that has an ok initial flavor and aroma to it but which is also very, very bitter. Review : It's been quite some time since I've had a black tea. Why? Hmm...I guess in order to explain that might require some deep and insightful psycho babble, something I'm not really in the mood to do at 1am on a Tuesday morning. Let's suffice it to say that I've had too many unpleasant tasting experiences with various shades of straight black tea, and have thus become a bit "phobic" about trying new black teas. But perhaps being in the mood for self-punishment tonight, I figured it was time to try and break this "black tea phobia" I had and give one a try. Hoping that my first black tea tasting experience in some time might be at least halfway decent, I decided to give a new black tea I found from Stash teas a try, a tea called Nilgirl Black and which is part of Stash's "India Collection." My theory on why I tried this tea was that it came in a nice looking box with a neat label for a black tea..."India Collection"...so naturally I assumed, or perhaps should say hoped, that this tea would be a few grades above the average generic black tea you find in the supermarket. Here is how Stash describes this tea : "Wildlife roam the Blue Mountains of South India. The green valleys have been home to a variety of cultures for centuries. On the tea estates of the Nilgiri hills the new leaves grow year-round. Like its environment, Nilgiri tea is versatile and welcoming. Robust but smooth, it can be enjoyed any time of day, black or with milk and sugar." The aroma of the tea was alright. I can't say the aroma was great, because it wasn't. But their was nothing about the aroma that said "this tea will be bad either." 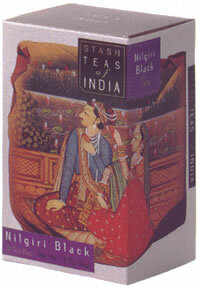 Basically, the tea had a fragrance like many other bagged black teas you'll come across. In short...it was average...and quickly forgettable. Now, with the first sip of this tea, I was somewhat surprised. I'll confess I'm not the biggest black tea fan around, but yet the tea tasted decently on the first sip. Too bad that flavor didn't last. But soon...say within 10 seconds...the greatest fear a tea junkie can have in the world of black teas set in. It was mean. It was bad. It was ugly. And it was unpleasant. What set in, of course, was the bitterness. And ick...what a bitter brew it was. The bitterness simply lingered, and lingered, and lingered...and was seemingly destined to be forever encapsulated on the taste buds of my tongue. Needless to say, I wasn't a happy camper upon this sad discovery. Yet I choked the tea down, hoping for redemption somehow. But redemption would not be coming to this tea this Tuesday morning. Instead, only the bitterness remained...reminding me once again why I'm so "shy" of trying bagged black teas I've never had before. Recommendation : No, unless you like a bitter black tea...then this tea will most definitely have your name on it.